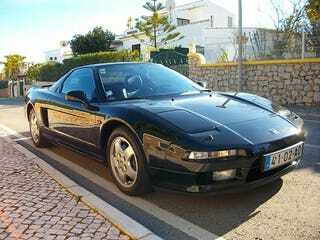 This 1993 Honda NSX (chassis T000999) is claimed by the seller to be one of three that were regularly used by F1 legend Ayrton Senna. The seller says that this is the one that was gifted to him by his personal mentor and sponsor Antonio de Almeida Braga that was kept in a palace near Estoril. The seller says that it has 31k original miles, is unmodified, and that he still has the factory carpet with Senna’s footprint still showing!